Great battle again by the Bulldogs, again a one-goal loss, this time in overtime. The battles the Bulldogs put in over these last two games on little to no rest, against a rested team, on their International sized Ice were very impressive. However, you don't play games at this time of year just to battle hard and be proud of your effort - you play to win. The Dogs were THAT close on back to back games, and if anything should gain confidence with how they skated with the Eagles. The day off tomorrow will serve them well, even if its a day spent travelling, that's much better than playing another game. 12 in 16 nights now. Just wow! An old saying goes that a series doesn't even begin until the Home team loses, and it's the Dogs job now to "hold serve" just like the Eagles have done. It will be something else to see the Dog Pound on Monday and Tuesday night! For the third straight series, the Dogs are in a 0-1 hole after a heartbreaking 1-0 loss last night at the South Surrey Arena to open up the Coastal Conference best-of-seven Final series. Winning 1-0 last night, losing 1-0 last night, in the end, it's just that - LAST NIGHT. Playoffs is all about moving forward no matter what, and getting ready for the next one. I expect the Eagles to be better, I expect the Bulldogs to be better. 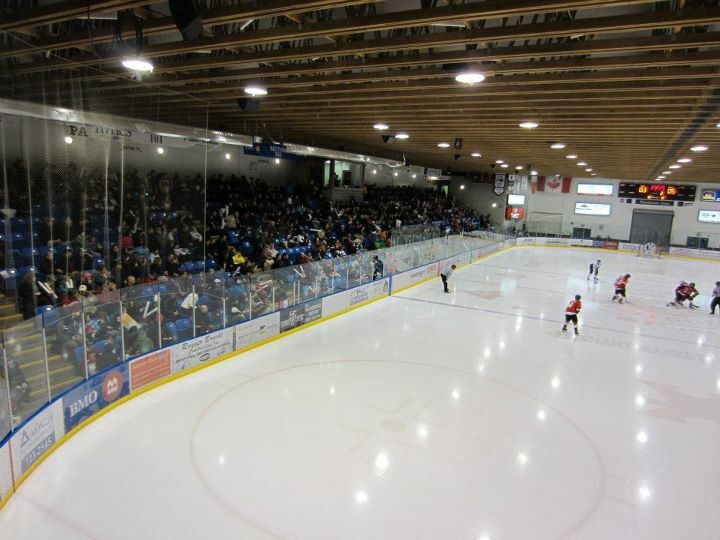 It was no Dog Pound, but it was a good atmosphere in Surrey last night and there was a good crowd on hand. Nice to see in the Lower Mainland. Get all the action on Boston Pizza Bulldogs Hockey on 93.3 The Peak FM tonight with the Pacific Chevrolet pregame show getting underway at 7:00 with the puck drop and play-by-play to follow at 7:15 with myself and Bruce MacDonald. Tonight's 2nd intermission guest is Jon Zacks, the play-by-play voice of the West Kelowna Warriors, currently down 0-1 in the Interior Conference Final after a 6-4 loss to the Penticton Vees. And by the way - a big welcome back to the Playoffs to the Interior Conference. It's nice to have you back playing and not sitting/watching/waiting as the Coast continues to kick each other around! And click the below image to enlarge the plans for Games 3 and 4 at the Dog Pound on Monday and Tuesday! Bring the noise folks! Hard fought game, tough to lose. 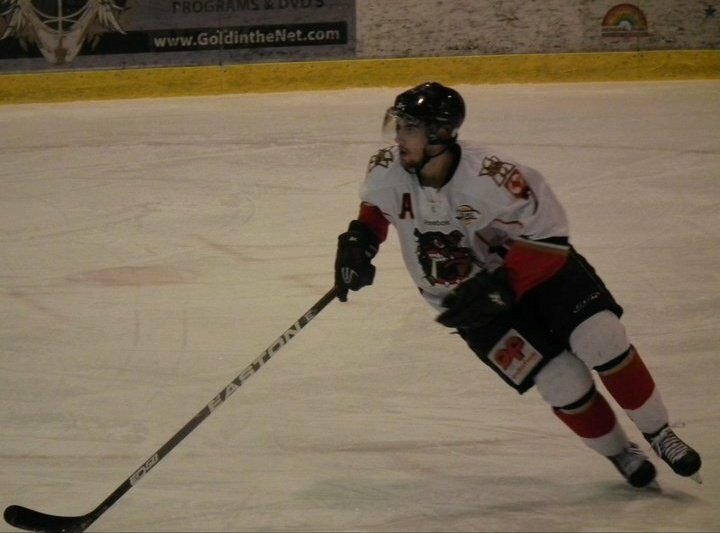 No rest for the wicked as the Alberni Valley Bulldogs are right back at it tonight as they open the Coastal Conference Final in Surrey. 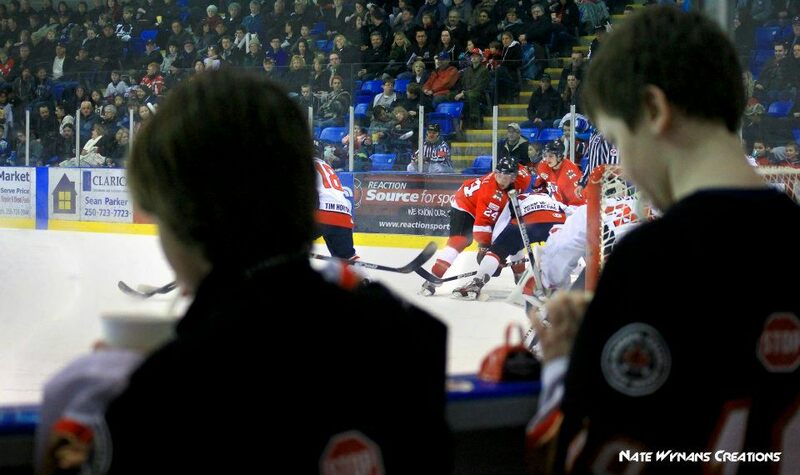 Games 1 and 2 of the best-of-seven are tonight and tomorrow night, with Games 3 and 4 Monday and Tuesday in Alberni. 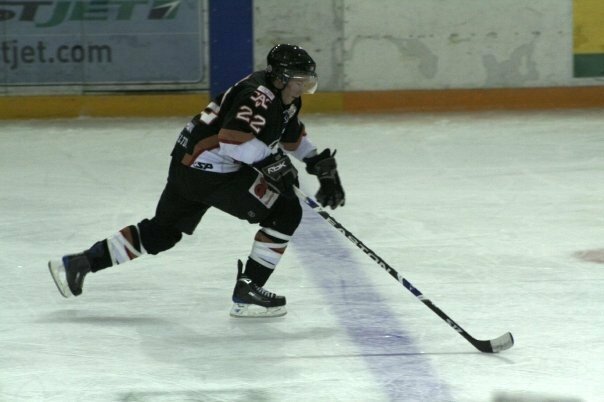 The Eagles have been sitting since sweeping the Chilliwack Chiefs on Monday night in Chilliwack with a 3-2 overtime win. Don't hold that against the Eagles though, that's the benefit of sweeping - you play less hockey, you rest and you heal. To a man the Eagles will probably tell you how hard that series really was, despite the fact it was a sweep. The Eagles also dispatched Langley in the first round in four games, so they have certainly played less miles than the Bulldogs. There is a fine line between rest and battle tested, on a roll, and dead tired. No matter what, you need to just focus on the task at hand and nothing more, and that's getting ready to play Game 1 tonight. 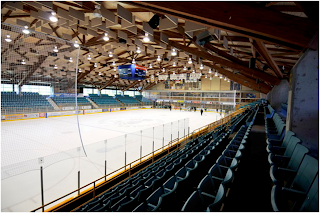 The South Surrey Arena will certainly be a factor with it's Olympic/International sized 200x100 ice sheet so the Dogs had best be ready to skate - but not chase when in the defensive zone. The Dogs have been playing from behind in each series so far - hey, you can't argue that it works to the point that they have found a way to get it done...but it is maybe why they have played 10 games to this point while the Eagles have played just 7. So here's hoping they can find a way to get off to a good start to not fall back into the hole again. It never ceases to amaze me the amount of magnification that comes into play when it gets to this time of year. Little things, big things...this time of year everything can be a big thing. I know the Bulldogs Coaching Staff listened to comments on the Grizzlies post game show regarding the crazy amount of time they were putting into video sessions on face-off play. It's not that the Bulldogs weren't putting the effort into draws, of course they were. They might have been further motivated by knowing that fact though, and spent more time on it and focused on it more as the series went on. Cue Game 4, and a face-off win directly leading to the game winner in OT. The same could be said about Game 5 and the series winning goal, just 18 seconds into overtime. The Bulldogs found out yesterday that they will be without Matt Hansen for the first two games of the series as he has been suspended for a blow to the head. Seems somewhat vindictive and sour grapes from the Grizzlies that they would take the time and the effort to do the paperwork and secure the video and send it all in to the league by early the next morning, but I guess when your season is over and you have nothing to do, I guess you have nothing but time on your hands. Maybe it's sending a message that they are sticking up for their guys, no matter what? Whether the season is over, I certainly don't want kids getting injured, and they need to feel that the league is protecting them if the Officials can't and I also see that side of it. On this hit in question what bothered me was that Matt Hansen was sticking up for HIMSELF, as he was just seconds earlier cross checked from behind and hit dangerously almost headfirst into the boards, and there was no penalty. Hansen goes back and finishes a hit agressively, and possibly high. Look the below video for yourself. Where is the Grizzlies players Head? Almost looks to me he Head fakes, and LOWERS his head at impact. One would think better video was used than the one above to necessitate a two game suspension? I'm happy I'm not the person that has to decide and is in the middle of all the teams warring on and off the ice against each other. Even when the series is OVER. Anyway, he ends up penalized, and the Grizzlies make it 1-0. At least the Dogs battled back, won the game, and it wasn't of consequence. Now the Dogs move on, and it is of significant consequence. I'll find the silver lining here - Hansen has been an incredible warrior, and has been banged up and battered and bruised. The rest will do him well. At the same time, he's one of the most dynamic offensive players in the league, and it's a shame to have him sit. 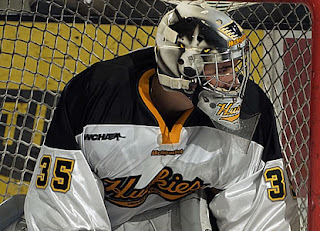 The message here is - don't retaliate and stick up for yourself - or at least don't cross that line while doing it as Hansen has done in the eyes of the Grizzlies and the BCHL. Discipline is a huge key this time of year. I certainly don't blame Hansen, as I would have been frustrated too, as the amount of attempts to "slow him down" throughout the series got a little much at times. The Bulldogs lose Hansen tonight, and I'm not sure if they get anyone back with Gosselin, Kerr, Strand and Stewart all out with injuries, all on questionable hits. That's the way she goes though, here's hoping there is another Mak Barden ready to make a name for himself! Get all the action on Boston Pizza Bulldogs Hockey on 93.3 The Peak FM with the Pacific Chevrolet pregame show kicking off at 7:00 with the puck drop and play-by-play to follow at 7:15 with myself and Bruce MacDonald. Tonight's 1st intermission guest is Bulldogs Captain Ryan Lough. 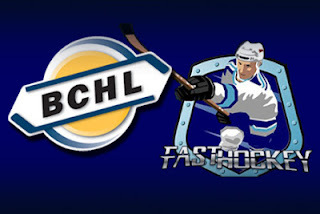 Tonight's 2nd intermission guest is Surrey Eagles play-by-play voice Brendan Batchelor, to give us some insight on the Eagles wins over both Chilliwack and Langley and his thoughts heading into this series. *A note on the Fast Hockey broadcasts - if you are using a tablet like an Ipad to watch the games, you can only get audio from the HOME broadcaster. From a laptop or desktop computer you can choose from both the HOME and AWAY broadcasts. Having both broadcasts available on the pay-per-view was something that generated a lot of feedback last year, and I have received word about it over the last couple of games in Victoria. The BCHL and Fast Hockey put a good amount effort into making both sides available this year. 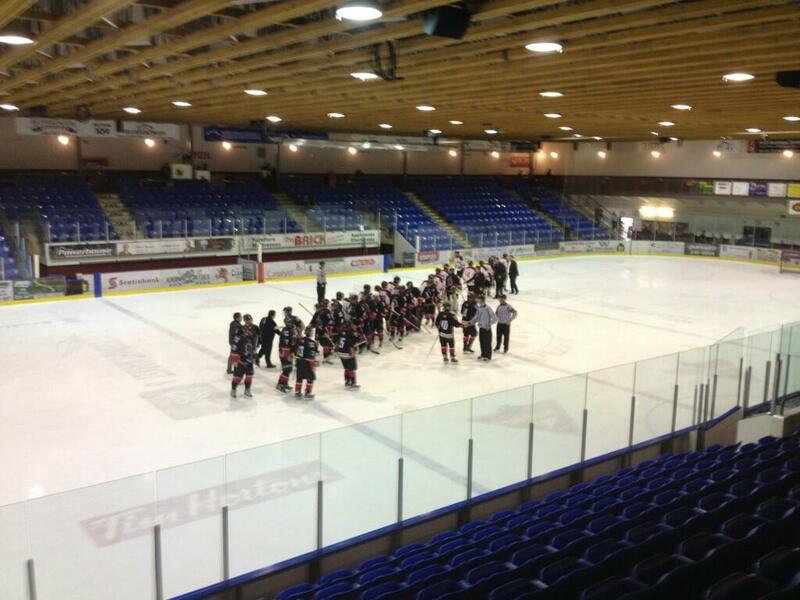 In some rinks like Alberni, it was LOTS of work to make it happen. It's certainly understandable that fans who have been accustomed to listening to their broadcast want to hear their broadcast, especially when they are paying for it. So - if you have been using an Ipad all year and you just plain didn't know - you can pick and choose, provided you can use a computer! Talk to you tonight from Surrey. Just plain wow. Watch the back heel kick pass by Tironese. I feel bad about the golf course comment, my heart sunk for the Grizzlies as much as it soared for the Dogs, they battled hard and it's tough for the kids to have their season end. Just lost in the crazy emotion of the moment, and a Grizz fan not a minute earlier had walked past the window and pantomimed a golf swing at me. Maybe he knew something I didn't? Can we name a street after Barden yet? NONE of this happens without the Jay Deo breakaway save on David Mazurek with 30 seconds left in the third, by the way! Wow. Just wow. Too many things to even begin to talk about here. Outstanding effort from the players, outstanding support from the fans willing them on. Here's what the throng of Dogs fans looked like as the team scored, and then celebrated right in front of them. Class moves by several Grizz fans who came into the booth and shook our hands and said "good game, good luck" and thanks to Grizzlies play-by-play broadcaster Scott Didmon who did the same thing. The Fitzgerald's were warriors, and after not being a fan of some of the things I saw in Games 1 and 3 in Victoria tonight I was sure impressed with how they almost willed the Grizz to a win tonight as they scored and set up both goals. The Victoria Grizzlies will be without Jaden Schmeisser tonight for the deciding 5th game of the series, as he has been suspended two games for his blow to the head on Hunter Stewart in Game 3 here in Victoria on Monday. Schmeisser appeared to leave his feet, and follow through with his elbow to Stewart's head. With both Strand and Gosselin knocked out of action on hits on Saturday night, it was certainly disheartening from the Dogs side of the puck to at least feel that players weren't being protected. Unfortunately during the game the four officials didn't see it as a penalty - of course it's a fast, hard game as I was saying last night and they can't catch everything. It's good to know that when the Officials during the game might not be able to get every call right, there is still the league to answer to in the name of protecting players. It's another series going the distance for the Bulldogs as they are heading down to Victoria tonight for a winner-take-all Game 5 tonight at Bear Mountain Arena. You know the Surrey Eagles have to be loving this series going the distance, sitting pretty after sweeping the Chilliwack Chiefs on Monday night. The Bulldogs will again be buoyed by their supporters on the road tonight, with one fan bus already sold out as of 30 minutes after the game last night. Get in touch with the Dogs office today if you want to get on a bus to head down to the game! If you are making your way down on your own - I look forward to seeing you there, and bring some noise with ya! The Bulldogs have obviously been in this position before, winning Game 5 in Nanaimo 2-1 last Wednesday (is that really when it was?) for the reverse sweep to win that series 3-2. The Grizzlies have also been in this position at home, eliminating the Kings in OT in Game 5 last week at Bear Mountain Arena. It's incredible how thin the line can be between winning and losing. A bounce either way, and both these teams could have been long gone and on their way home already and we wouldn't have had the chance to witness all this fun and madness. Thanks for battling boys, and keep 'er going. I have said something along these lines already - appreciate the moment, but don't get lost in it. The chance may never come again. Get all the action on Boston Pizza Bulldogs Hockey on 93.3 The Peak FM with myself and Bruce MacDonald with the Pacific Chevrolet pregame show getting underway at 7:00 with the puck drop and play-by-play to follow at 7:15. Tonight's 1st intermission guest is Bulldogs Affiliate Player Mak Barton, who went from an unknown no-name to a household name overnight with his 2 goals last night and 1st star honours. VIDEO - Marlon Sabo wins it. Dog Pound a zoo. Never say die, Dogs top Grizzlies 4-3 in OT. Mak Barden? Are you kidding me?! If you missed it on the postgame show on THE PEAK - Adam Hayduk credited Bulldogs Lower Mainland Scout Lee Stone with identifying Barden as a player to add...quite the story. I don't think I have ever said the name of a player TWICE when he scores a goal during the play-by-play. I like to think I get it right the first time clearly enough so people listening also know, or it's a crazy scramble goal in a pile and I just don't know period. I had to say BARDEN twice for the simple fact that anyone listening might have been saying "WHO" if they had just tuned in. I was like UFC on ice it seemed in this game at times as the teams battled so incredibly hard over the puck on every single play. I still would have thought there would have been a call when Teal Burns was thrown into the Victoria bench. At least that's how it looked to me, that there was an extra and late effort to throw him onto his head - and by default send the blades of steel on his feet skywards at everyone else's heads. This guy has already kicked a pane of glass out this season, a video that went viral and has over 30,000 views. Just seems like a dangerous play and it wouldn't be a nice scene or publicity if those skates go into the bench in that fashion and catch on of the Grizzlies or their Staff - credit to them by the way for not getting involved with Burns when he was in the bench. In saying all of the above - I sure can't imagine the fine line of trying to officiate that, how hard it is, and how fast it is and also how high the stakes are on every call. The Dogs had an icing go against them in the game and they also had an intentional offside judgement go against them in OT. A Grizz face off win and a shot and a goal on one of those, and who knows? Instead, it's a Magic Marlon Sabo Knucklepuck - the loudest I have EVER heard that rink, besides MAYBE the Andrew Ella OT winner against Nanaimo in 2006 for 18 straight wins. 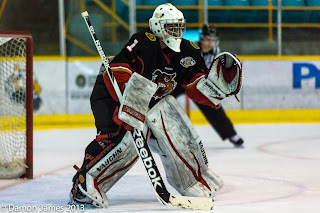 It's another must-win game for the Bulldogs tonight to extend their season as they host the Grizzlies in Game 4 tonight at the Dog Pound after dropping a 4-1 decision in Victoria last night. It's almost old hat for the Bulldogs now, as they have had three must-win games already. The fact that they are still playing shows that they have been able to rise to the challenge. Here's hoping they can find a way again tonight to get it done. 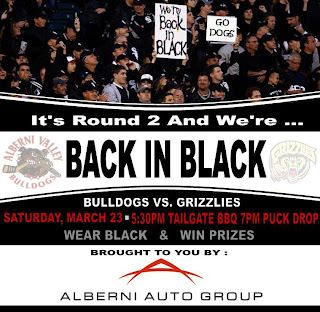 It will no doubt be another jam-packed Dog Pound, and there's lots of pregame stuff to get you out to the rink early as Alberni Autoworks hosts a Tailgate party starting at 5pm with proceeds to Special Olympics and Alberni Valley Minor Hockey. Lance Lapointe will again be playing live, and Jolie McMullan will once again be broadcasting live on THE PEAK from outside the rink. Get all the action on Boston Pizza Bulldogs Hockey on 93.3 The Peak FM with the Pacific Chevrolet pregame show kicking off at 6:45 and the puck dropping just after 7:00 with myself and Bruce MacDonald. Tonight's 1st intermission guest is Bulldogs Dman Marlon Sabo. Not a good effort by the Bulldogs tonight. After coming down yesterday early and being here today eliminating the travel, the Bulldogs didn't have much push from the get go. I expected them to jump out flying, but they were flatter than flat. 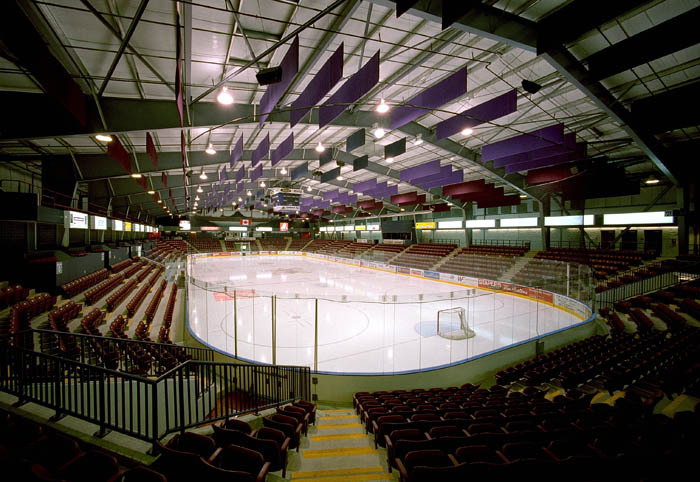 Looking forward to the energy the best barn in the league will bring tomorrow, the Dogs will certainly need it! It's a huge Game 3 of the best-of-five Island Finals as the Bulldogs visit the Grizzlies tonight at the Bear Mountain Arena. The Bulldogs actually headed down Island last night to put them in the best position to compete today, staying in a hotel, having a game day skate today and a good nap without the 2.5 hours of travel time on the bus on game day. I would have enjoyed the down time and more relaxed schedule but I had to do THE PEAK Morning show today. I guess someone has to recap the exploits of this team to the community! Get all the action on Boston Pizza Bulldogs Hockey on 93.3 The Peak FM with myself and Bruce MacDonald bringing you all the action starting with the Pacific Chevrolet pregame show at 7:00 with the puck drop and play-by-play to follow at 7:15. 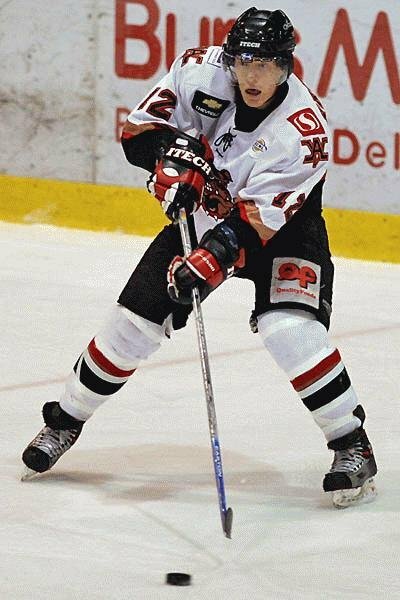 Tonight's 2nd intermission guest is former Bulldog Defenceman Eliot Raibl, now at RIT and a teammate of former Bulldog Josh Mitchell. An update on ticket sales - the Bulldogs office will be open today from 2pm to 6pm and tomorrow from 10am to game time and beyond, selling tickets for Tuesday night's Game 4. Great game by both teams, great battle. Game 3 goes Monday in Victoria, Game 4 goes Tuesday at the Dog Pound. 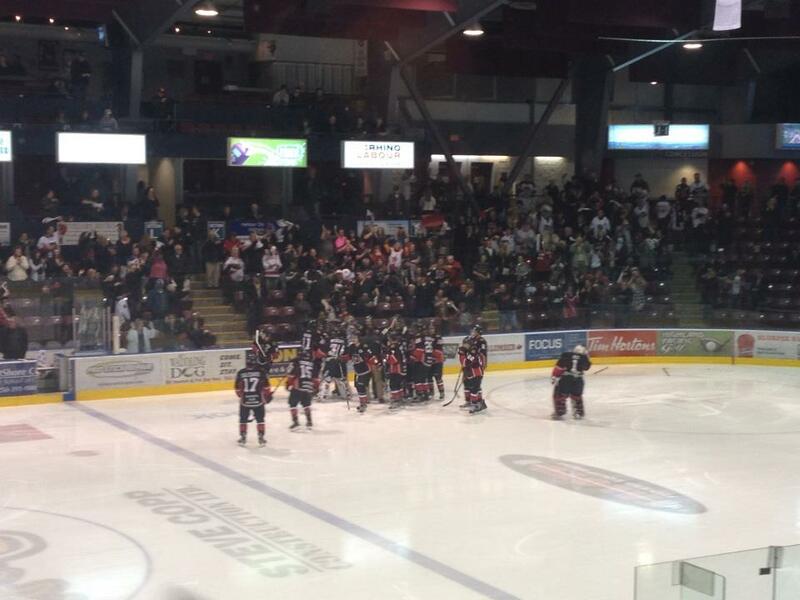 From "Unite in White" in the first round against Nanaimo, to "Back in Black" tonight for Game 2 against the Grizzles. Man I hope Charles Mealey can fit that tune in at some point! Jolie will be Broadcasting live from outside the Multiplex starting at 5pm tonight! 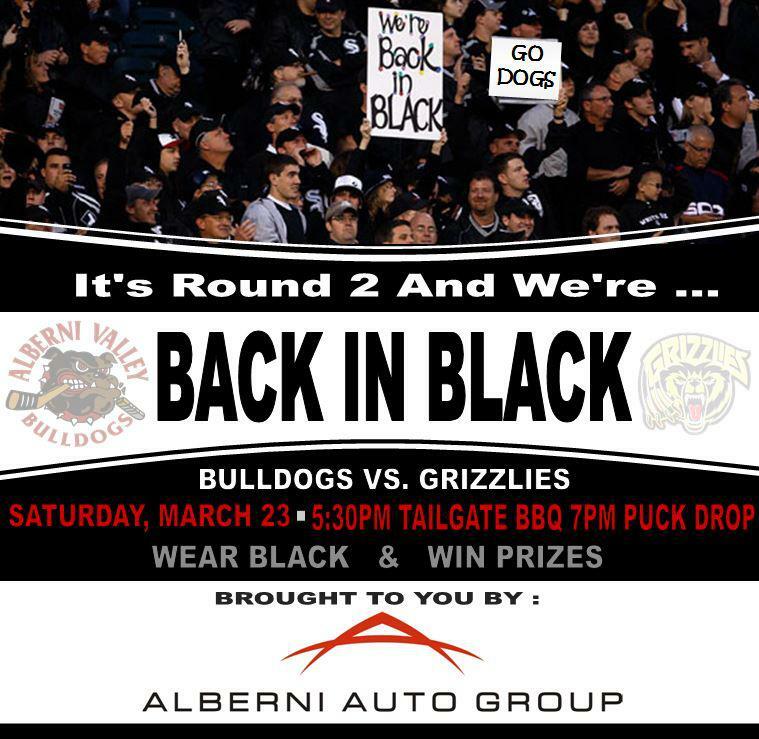 Right back at it, the Bulldogs and Grizzlies play Game 2 at the Dog Pound tonight, a huge Game 2 in this best-of-five series. You can bet the Dogs are thrilled to get back home again after a couple straight on the road. I hope they don't think it's going to be easy on home ice though. You need to be ready to play, plain and simple. Up in the booth last night myself, Bruce and Dan didn't think the team played especially well for the most part - until they made it a one-goal game with seven minutes to go. They certainly had their chances earlier, Ryan Lough all alone early in the second just missing high and wide was one of several glorious looks - but they spent the better part of the game chasing the puck and having the game dictated to them. Coach Willison on the Post Game show said something along the lines of "none of those guys have a big switch on their back that's on or off - you are either ready to play - or you aren't"
I certainly agree with that and have stated as much on several occasions when the Dogs or the opposition aren't at the same level as the other team. What was funny last night that had Dan and Bruce laughing at me was what happened with about 8 minutes to play in the third and the score, shots/chances, and flow of play favouring Victoria, and the Dogs not looking like they were going to get going. I was making the point that the Dogs needed to finish this game strong and to find another gear, that they needed to remember that this isn't just a game, but a SERIES, and a war of attrition. I said they needed to finish the game strong and finish their checks, and if they weren't going to win the game, they needed the Grizzlies to know that they were IN a game. I finished the statement by saying something along the lines of - but how about they just win this game instead, as it's not over yet. Not 10 seconds later the Bulldogs scored to make it 3-2. And it actually WAS like all the players had a big ON/OFF switch on their backs. They all of a sudden were absolutely flying and they controlled the game, won the battles, and looked like a million bucks while just missing on several chances to tie the game. One can't help but wonder what the series would be at right now if the Dogs had been able to play a full 60 minutes like that, or at the very least more than the last 7 minutes of the third period. Here's hoping the Dogs can find a way to play at that higher level from the get-go and through the bulk of the game tonight. If they do, they'll have a chance to win the game and even the series. Catch all the action on the Pacific Chevrolet pregame show on Boston Pizza Bulldogs Hockey on 93.3 The Peak FM at 6:45 with the puck drop and play-by-play to follow with myself and Bruce MacDonald at 7:00. Tonight's 2nd intermission interview guest is former Bulldog Kevin Genoe, now at Michigan Tech and a teammate of former Bulldog Walker Hyland. Bulldogs were flat for the most part of the first 50 minutes of the game, but got it going late to make a game of it. Unfortunately, you aren't going to beat the Grizzlies playing 10 minutes! Back at it tomorrow night at the Dog Pound! Here's the game winning goal - safe to say Jay Deo doesn't have any chance to make the save as Chris Albertini goes to the net - is not pushed in - and makes contact with Deo's head/shoulder/upper body and takes him right out of the play and his net. Holding any tongue in cheek references and letting the video speak for itself on this one. It's crying over spilt milk now, but you could bet the other side would be doing the same thing if the situation was reversed. I'm all for going hard to the net, and hard playoff hockey, but if this is going to be allowed we might as well play 6 on 6, no goalies, and the first to 50 wins? The goalie needs to have an opportunity to make the save. 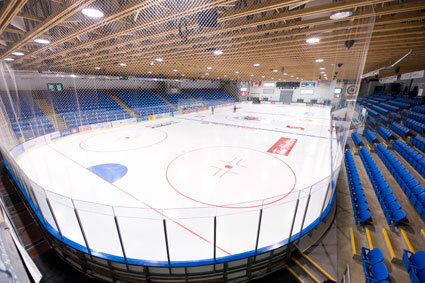 It certainly caught me by surprise yesterday when the schedule was released that showed a Friday game in Victoria, Saturday off, and Game 2 Sunday in Victoria followed by Monday and Tuesday games in Alberni and a Game 5 in Victoria on Wednesday, possibly forcing the teams to play over four straight days. The Grizzlies are certainly in a tough position with the "Rink of Dreams" 24 event Saturday to Sunday - you aren't ever going to hear me complain about an event that helps children battling life-threatening conditions. One would assume the event was booked a long time in advance and it wasn't a surprise. 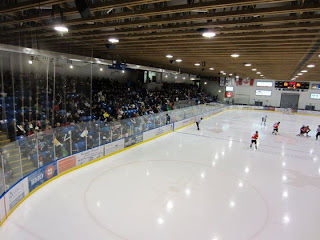 Throw in the impending WHL Playoffs beginning Thursday at Bear Mountain Arena due to the World Curling Championships evicting the Royals and the Grizzlies are caught in a tough place. I'm just mostly happy that I am totally 100% removed from all of the discussions and negotiations and back and forth that no doubt goes on behind the scenes in scenarios like this because they can't be fun. Of course no team that has battled hard all season and has earned Home Ice would want to give up the opening games of a series on home ice, at the same time I think in the end the teams agreed that putting the players in a position to play four straight days was just too much. Who knows what to expect from this series. I am never a fan of predicting, as I have just seen too much stuff over the years of the unpredictable variety. I expect a good series, with the teams battling hard and playing tight hockey throughout the season series. The Bulldogs Head to Head record against Victoria in 8 games was 2-2-0-4. The first four games head-to-head went to overtime, with the team that won the game in the end never leading the game, the Grizzlies won the first three with the Dogs winning the fourth. One of the Bulldogs wins was in overtime, four of the Grizz wins were in overtime, and one of them came with the game winner coming in the final 30 seconds. 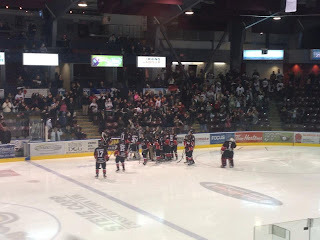 The Bulldogs won once in Regulation, the final meeting, March 9th in Victoria by a score of 6-4. No lead has been safe, every game has been entertaining. Drop the puck already! Catch all the action on Boston Pizza Bulldogs Hockey on 93.3 The Peak FM with the Pacific Chevrolet pregame show kicking off at 7:15 and the play-by-play and colour getting underway at 7:15 with myself and Bruce MacDonald. Tonight's 1st intermission guest is Bulldogs Defenceman Chase Van Allen, while Chilliwack Chiefs voice Mark Fitzgerald is the 2nd intermission guest. The Chiefs open the Mainland Final tonight in Surrey. The Van Isle Ford Midget Rep Bulldogs picked up an exciting 5-4 win yesterday over Quesnel in the Semi Finals of the Midget Tier 3 Provincials to book a ticket to today's Gold Medal Game at 11:00 at the Mutiplex. 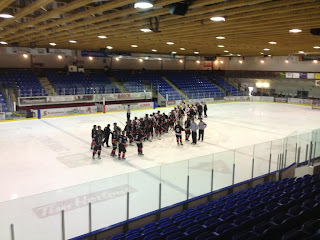 They will face Whistler, who picked up a 2-0 win over Smithers in the other Semi. Smithers and Quesnel are up in first in the Bronze Medal game at 8:00, with the closing ceremonies following the Gold game.